Due to the variety of brands available in the market, it can be difficult to find the best pregnenolone cream for your needs. If you are one of those people that is facing this problem, then this article will help you. Pregnenolone is a natural hormone produced in the body, and is the precursor hormone for testosterone and estrogen. It has several non-tropic benefits, and is used as a mood enhancer, as an energy pill, and boosts focus. The level of pregnenolone in our body declines as we age, so it’s important to use pregnenolone products to address this issue. We will tackle their pros and cons, examine their best features, compare their prices, and check consumer reviews, to find out which one best suits your pregnenolone needs. Available in a 2-ounce pump bottle, Life-Flo Pregnenolone has a non-greasy formulation and is designed for optimal absorption. It is free of parabens and other synthetics, making it safe for regular use. Other ingredients include Glycerin, Purified Water, Aloe Vera Gel (Aloe Barbadensis), Potassium Sorbate, Sodium Hyaluronate, Grade Seed Extract, Methylsulfonylmethane (MSM), Vitamin E, Glyceryl Stearate, Stearic Acid, and Sodium Bicarbonate. This product is packaged in an airtight container. Each full press pump contains about 15mg of natural Pregnenolone, and a single bottle delivers 20-30 pumps that can last for 60 days. The Progesta-care Complete by Life-Flo comes in a 4-ounce size bottle. It is free of synthetics and its formulation contains 360mg of Pregnenolone, 360mg of 7-Keto DHEA Acetate, and 480mg of Progesterone per ounce. This product works well as a natural solution for those who are suffering from peri-menopause and menopause symptoms. Female users have reported that it made their periods pain-free and helped with hot flashes and night sweats. Each full pump press gives about 20mg of natural Pregnenolone, 15mg of7-Keto DHEA Acetate, and 15mg of Progesterone. Other ingredients include Purified Water, Glycerin, Sunflower Seed Oil, Stearic Acid, Sodium PCA, Stearyl Alcohol, Magnesium Aluminum Silicate, and Sorbitan Stearate. Allvia Pregnenolone is available in a 2-ounce size bottle and contains natural Pregnenolone, Grape Seed Extract, and Methylsulfonylmethane (MSM). It is unscented and free of parabens, soy, and tea. Complementary ingredients include Purified Water, Aloe Vera Gel, Potassium Sorbate, Sodium Hyaluronate, Sunflower Seed Oil, Shea Butter, Glyceryl Stearate, Evening Primrose Oil, Vitamin E, and Lecithin. Users claim that this product helps improve their sleep and regulate their hormones. It promotes relaxation and helps heal adrenal fatigue and some skin conditions. 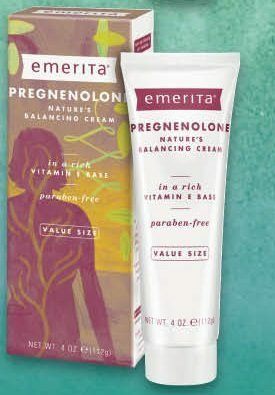 The Emerita Pregnenolone Balancing Cream comes in a 4-ounce tube and contains approximately 84 ¼ teaspoon applications. It is paraben-free and rich in Vitamin E (Tocopheryl Acetate). Ingredients also include Water, Aloe Vera Leaf Juice, Sweet Almond Oil, Safflower Seed Oil, Glycerin, Stearic Acid, Glyceryl Stearate, Sorbic Acid, Caprylyl Glycol, and Potassium Hydroxide. This product is free of petroleum, mineral oil, and any animal-based ingredient. Using this balancing cream effectively boosts energy and helps get rid of wrinkles. It works well for sensitive skin, and may be used around the eye without getting irritated. Available in a 4-ounce size bottle, the Pregnenolone (Bioidentical) Crème by Natural Radiance is a soy-free and fragrance free cream that promises to promote longevity by slowing the aging process. Its ingredients also include Purified Water, Aloe Vera Gel, Safflower Seed Oil, Sepigel 305, Evening Primrose Oil, Hemp Seed Oil, Potassium Sorbate, Sorbic Acid, Grape Seed Oil, and Apricot Kernel Oil. This product works well for menopause and reduces irritability. It is easily absorbed into the skin and does not leave a greasy feeling after application. Among other great benefits, this pregnenolone cream detoxifies the body, improves the immune system, and enhances the body’s stress response. Pregnenolone is a hormone produced naturally in the body, but several factors can disrupt its proper production. Also as we age, natural production of this hormone decreases. Pregnenolone is considered as the 'mother hormone' because it is the precursor for the steroid hormones estrogen, progesterone, testosterone, and cortisol in both men and women. Therefore, it is important in the maintenance of these hormones in the human body. It also helps balance out the levels of several other hormones, so it is very important for both men and women. Just like phosphatidylserine, pregnenolone helps improve brain function. This compound is said to modulate NMDA receptors in the brain, which are instrumental in various cognitive functions. Hence, it improves the transmission of messages between neurons, resulting in better learning, focus, and memory. It’s important to find out everything you can about health and fitness products, before making a purchase. Pregnenolone creams are no exception. One aspect you should pay close attention to is the active ingredients. Pregnenolone is a derivative of diosgenin, a compound that is extracted from wild yam. Consuming diosgenin-containing pills does not work because our body does not have the ability to convert this compound to pregnenolone. That’s why there’s a need to convert diosgenin to pregnenolone, to prepare it for human consumption. Other components include magnesium stearate, hypromellose, and silica. Magnesium stearate makes manufacturing easier; hypromellose is used as an emulsifier; and silica works to prevent caking. May impair memory acquisition and retention. May decrease wakefulness as pregnenolone sulfate stimulates deep sleep. May cause anxiety, as reported by some consumers. May cause steroid-like minor side effects such as acne, headache, irritability, hair loss, irregular heart rhythm, and insomnia. May interact with other drugs or medications that involve estrogen and DHEA. May stimulate prostate cancer cell growth. Previous studies show that taking 25mg of pregnenolone a day is safe and well-tolerated in humans, with mild side effects. It has not been shown to affect heart rate, the menstrual cycle, glucose levels, and blood pressure. It also does not lead to weight loss or weight gain. The recommended dosage varies depending on the health and age of the individual. Hence, it is important to consult a licensed health-care practitioner before taking any pregnenolone supplement. A full-pump press of pregnenolone cream can be applied once per day for 25 consecutive days. The user should then take a five-day break before using it again. For better results, rotate the application of the cream between the hands, chest, face, thighs, and inner arms. Considering the value, benefits, as well as the reviews from previous consumers, it is quite clear that the winner of this product round-up is the Life-Flo Pregnenolone. This product gives value for your money and provides the health benefits that you would expect in the best pregnenolone cream. Furthermore, it is all-natural and thus is safe for regular use and does not cause any major side effects. Its pros clearly outweigh its cons, as verified by the online reviews from satisfied customers.